As part of his effort to fight heroin trafficking, Lake County, Florida, Sheriff Peyton Grinnell has released a video pledging to go after drug dealers, but the effort from the sheriff's "Community Engagement Unit" is both creepy and wrong-headed. 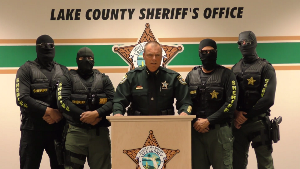 The video features the sheriff surrounded by four masked officers, their eyes hidden behind sunglasses, their torsos protected by bullet-proof vests, wearing the olive green pants of the military -- not the blue of law enforcement. They look like some sort of paramilitary hit squad, and that's what Sheriff Grinnell promises they will be. "To the dealers that are pushing this poison, I have a message for you," the glowering sheriff warns. "We're coming for you. As a matter of fact, our undercover agents have already bought heroin from many of you… To the dealers, I say: Enjoy looking over your shoulder, constantly wondering if today is the day we come for you. Enjoy trying to sleep tonight as you wonder if tonight's the night our SWAT team blows your door off its hinges." The message is presumably designed to be reassuring for the good citizens of Lake County, but the sheriff's promise of increased resort to paramilitarized, high-intensity, middle-of-the-night drug raids is anything but, given the record of SWAT raid errors over the years. The New York Times recently reported that in the past six years alone, at least 81 civilians and 13 cops have been killed in "dynamic entry" raids, oftentimes after police obtained a "no-knock" warrant allowing them to bust in a door and go in heavy without warning. And as the Washington Post noted in a roundup of SWAT raid mishaps last fall, such mistakes -- sometimes fatal -- continue to occur with depressing regularity. But even when no one is killed and no headlines are made, mistaken SWAT raids corrode public confidence. Families whose children are subjected to screaming masked intruders kicking their doors down in the middle of the night and pointing guns at their heads are likely to be traumatized for years even if the cops say "sorry." Heroin is a serious problem, and it is illegal. We expect police to enforce the law, but there has to be a better way than treating drug suspects like they're ISIS terrorists or Iraqi insurgents. What ever happened to, "We've got the place surrounded. Come out with your hands up!"? What are we doing to children and the disabled? We see the terrified faces of children from war zones around the world on television every day. We see in the children’s faces the result of heavily armed mask men break into homes and drag parents away. You can almost feel the fear when you look into the eyes of these children. I could feel the fear in a young girl’s eyes when we entered her home and put her dad to the floor with a gun to his head. It wasn’t in some far away war zone; it was a search warrant for marijuana right here in America. And I’ve never got that look of fear in the little girls out of my head. I’m afraid we are going to see a lot more SWAT raids for heroin in the coming year. As physicians cut the dose of their pain patient’s medications out of their fear of DEA, patients will turn to the street to maintain their current level of pain relief. Patients build a tolerance to opioids, so lowering the dose and expecting the same level of pain relief just doesn’t make sense. We can expect more suicides by pain patients in the coming year, as well as attrsts as more heroin and methamphetamine use by pain patients increases. Yes stimulants have an analgesic effect on their own. Do a search for the “Simultaneous Use of Stimulants and Opioids.” What you find may surprise you!! It has been long-established that amphetamines and other stimulants have an analgesic effect in their own right and significantly enhance the analgesic effects of opioids. It’s a puzzling situation. History and science are pretty clear: the simultaneous use of stimulants and opioids have, for over a century, been reported to be a superior combination for pain relief. So, based on history, why isn’t every patient who’s taking opioids also taking a stimulant?